Howdy Y’all! On October 6, 2018, I’ll be teaching a cooking class for kiddos and their parents at the NEISD Community Ed Center (8750 Tesoro). 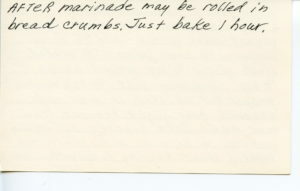 The recipes are Mid-Century Southern Standards. Relying on my mother’s recipes, I’ve tweaked and updated her classics with Life Hacks for the busier life style of the 21st century. 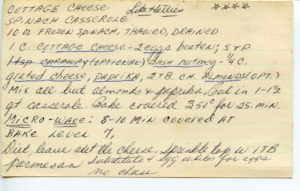 I’m attached two recipes in Mom’s own handwriting. The original recipes are timeless, easily prepared and nutritious. And versatile. Yogurt Chicken is nothing more than Tandoori Chicken, American Style. My mom would not be surprised that this basic recipe of hers is based upon Indian Cuisine. She loved international foods. 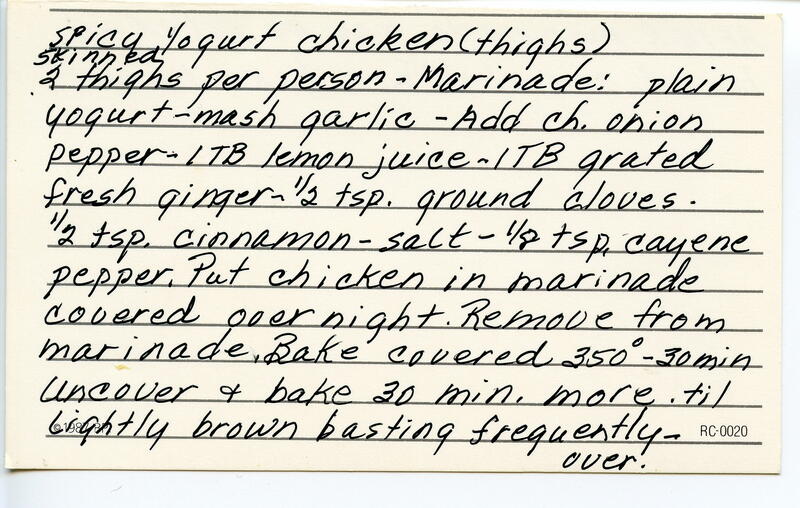 Gram’s Skinny Yogurt Chicken – Back Side. One of the things I love most about this recipe is the versatility. 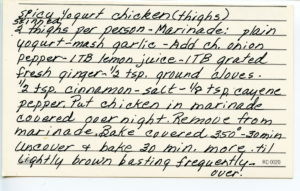 The marinade works for pork or turkey as well as any cut of chicken. Bake the chicken, either covered or uncovered. The chicken can be baked ‘au natural’, removed from the marinade and patted dry. Or, the chicken can be rolled in bread crumbs, crushed potato chips, crumbled Shredded Wheat Cereal biscuits (plain not sugar coated). Bake on a greased baking sheet. Or line the sheet with parchment paper or a Silpat for easy clean up. Finally, you can add or remove spices, based upon your tastes. This dish is great grilled. The breaded version can also be pan-fried, if you want the extra crunch. RECIPE TWO – SPINACH FRITTATA – What’s In A Name? A LOT!! This recipe started life as Spinach Cottage Cheese Casserole. YUCK! 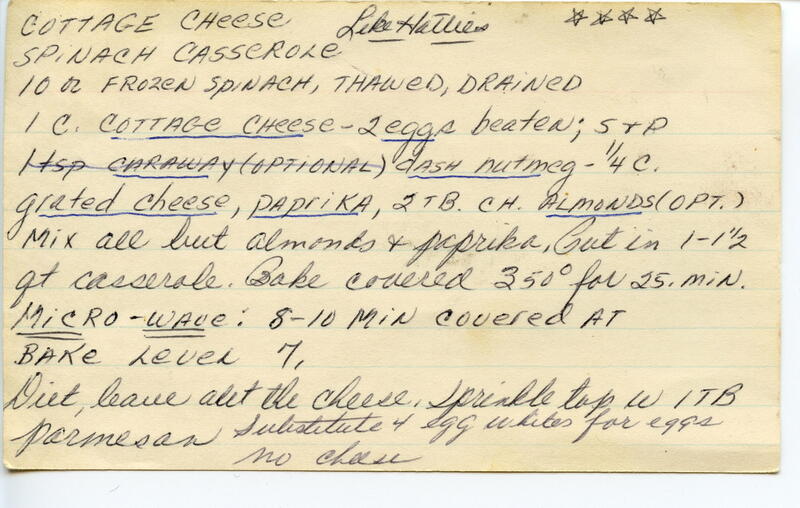 Everything my generation ate in the 60s, especially weeknight, were Casseroles .…..Tuna Casserole…. Chicken Soup Casserole, Cottage Cheese Casserole. Casseroles were convenient, fast, and frequently mushy or soggy, one dish meals. BORING!! This recipe served multiple functions: Diet Dish, Vegetable Dish, Protein Dish, One Dish Meal. Easy to prepare and cooked in record time. In the time it took to set the table and make a salad (and drink the first cocktail) my mother had a nutritious meal ready. This dish is as versatile as the Yogurt Chicken. Add more eggs and a bit of heavy cream, and you’ve got a QUICHE. Add a can of drained Rotel, plus a bit more cheese, and you’ve got a spicy veggie frittata, full of protein. Cook it covered or uncovered, it is a joy to watch as it bakes. It puffs up while baking, and later deflates when cooling. It’s soooo easy. 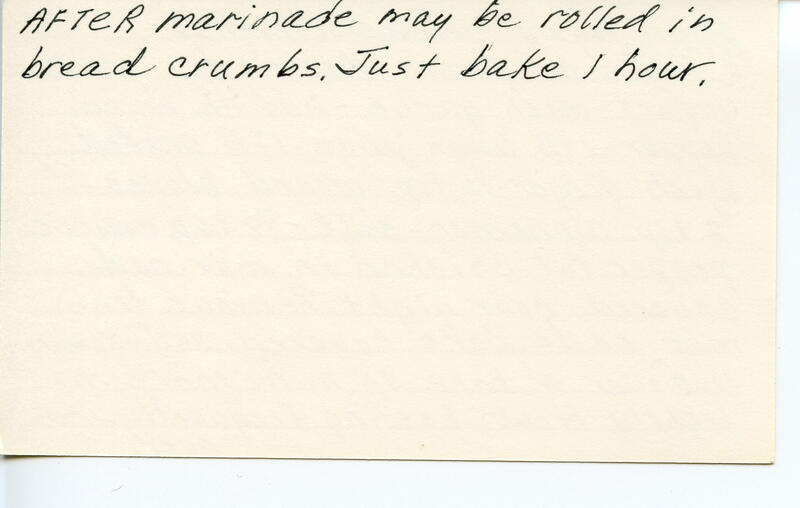 My mother and Grandma Hattie are both laughing at me for ignoring this recipe for so long. The only permanent change I’ve made to this recipe is the addition of a few grains of rice. Uncooked rice (15-20 kernels) absorbs any excess moisture that you may have inadvertently left in the spinach. You hardly notice the rice. The frittata is light, yet filling.